Last year’s quinella of Secret Agenda and Viddora headline the nominations for the 2018 Group 1 $1m Robert Sangster Stakes (1200m) at Morphettville on May 5. Secret Agenda, above, is among the nominations for the 2018 Robert Sangster Stakes at Morphettville. Photo by Jenny Barnes. Thirty-two fillies and mares have been nominated for the Robert Sangster Stakes with the Lindsay Park trained Catchy and Anthony Freedman’s Shoals adding to the Group 1 winners among the entries. Catchy, the winner of the 2017 Group 1 $1.5m Ladbrokes Blue Diamond Stakes (1200m) at Caulfield, is one of four fillies and mares prepared by the team at Lindsay Park, David and Ben Hayes and Tom Dabernig, and is joined by Formality, Miss Gunpowder and Tulip. Shoals is a two times Group 1 winner for Freedman with victories in the $500,000 Myer Classic (1600m) at Flemington during the 2017 Melbourne Spring Carnival as well as a win in the $500,000 James Boag’s Premium Surround Stakes (1400m) at Randwick during the 2018 Sydney Autumn Carnival. The Mick Price trained Secret Agenda and Lloyd Kennewell’s Viddora clashed again at Morphettville last Saturday on their way to this year’s Robert Sangster Stakes when they finished second (Viddora) and third (Secret Agenda) in the Group 3 $120,000 Hughes Limousines R N Irwin Stakes (1100m). Price is toying with the idea of putting the blinkers on Secret Agenda in a bid to help her claim back to back wins in the Robert Sangster Stakes. “Last year she led throughout to win the Sangster, so that’s a bit abnormal for her,” Price told the Herald Sun. 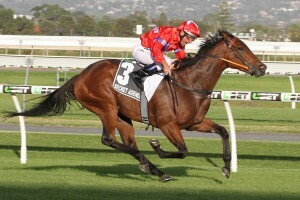 The R N Irwin Stakes winner Dainty Tess is also among the nominations for the Robert Sangster Stakes. Leading Victorian trainer Darren Weir also has a strong team of four nominated the Robert Sangster Stakes, head up by Quilista who scored a hat trick with her all the way win in the Group 2 $300,000 Sapphire Stakes (1200m) at Randwick on day two of The Championships on April 14. Weir’s other entries are Lyuba, Twitchy Frank and Whispering Brook. The locally trained Viddora heads the pre-post betting for the Robert Sangster Stakes at $4.50 with Ladbrokes.com.au ahead of Dainty Tess and Quilista at $7 and Catchy at $9.